Q-Connect Multipurpose Labels 63.5x38mm 21 Per Sheet White (Pack of 2100) KF26051 Pack of 1 Q-Connect multi-purpose Labels. Bright White self adhesive labels, suitable for all types of printers. Label Size 63.5mmx38mm - 21 labels per sheet. Q-Connect Multipurpose Labels 199.6x289mm 1 Per Sheet White (Pack of 100) KF26050 Pack of 1 Q-Connect multi-purpose Labels. Bright White self adhesive labels suitable for all types of printers.. Label Size 199.6mmx289mm - 1 label per sheet. Q-Connect Multipurpose Labels 199.6x143.5mm 2 Per Sheet White (Pack of 200) KF26056 Pack of 1 Q-Connect multi-purpose Labels. Bright White self adhesive labels suitable for all types of printers.. Label Size 199.6mmx143.5mm - 2 labels per sheet. Q-Connect Multipurpose Labels 99.1x38.1mm 14 Per Sheet White (Pack of 1400) KF26054 Pack of 1 Q-Connect multi-purpose Labels. Bright White self adhesive labels suitable for all types of printers. Label Size 99.1mmx38.1mm - 14 labels per sheet. Q-Connect Multipurpose Labels 99.1x67.7mm 8 Per Sheet White (Pack of 800) KF26055 Pack of 1 Q-Connect multi-purpose Labels. Bright White self adhesive labels suitable for all types of printers. Label Size 99.1mmx67.7mm - 8 labels per sheet. 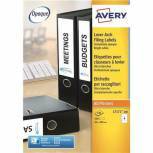 Avery Lever Arch Filing Labels 200x60mm (Pack of 100) L7171-25 Pack of 1 Helps to create an efficient office system and saves time looking for lost documents. 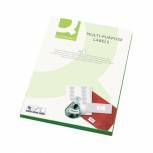 Lever arch labels, 200mmx60mm, 4 label per sheet, 25 sheets per pack. L7171. Q-Connect Multipurpose Labels 99.1x34mm 16 Per Sheet White (Pack of 1600) KF26053 Pack of 1 Q-Connect multi-purpose Labels. Bright White self adhesive labels suitable for all types of printers. Label Size 99.1mmx34mm - 16 labels per sheet. Q-Connect Multipurpose Labels 38.1x21.2mm 65 Per Sheet White (Pack of 6500) KF01130 Pack of 1 Q-Connect multi-purpose Labels. Bright White self adhesive labels suitable for all types of printers. Label Size 38.1mmx21.2mm - 65 labels per sheet. Avery Laser Address Labels QuickPEEL 63.5x38.1mm 21 Per Sheet White (Pack of 2100) L7160-100 Pack of 1 Avery White Laser Labels L7160. Premium labels, easy to use and specifically designed to work in the high temperatures of laser printers, ensuring high quality printing with no toner flaking. Address. 63.5x38.1mm. 21 labels per sheet. 100 sheets per box. 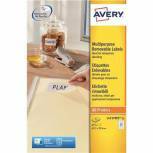 Avery Removable Labels 99.1x42.3mm 12 Per Sheet White (Pack of 300) L4743REV-25 Pack of 1 Removable laser labels adhere securely to any smooth surface and are easily removed when needed. Easy to format. 99.1 x 42.3mm. Ref: L4743REV-25. 12 labels per sheet. Q-Connect Multipurpose Labels 64x33.9mm 24 Per Sheet White (Pack of 2400) KF26071 Pack of 1 Q-Connect multi-purpose Labels. Bright White self adhesive labels, suitable for all types of printers. 64mmx33.9mm - 24 labels per sheet. Q-Connect Multipurpose Labels 63.5x46.5mm 18 Per Sheet White (Pack of 1800) KF26052 Pack of 1 Q-Connect multi-purpose Labels. Bright White self adhesive labels, suitable for all types of printers. Label Size 63.5mmx46.5mm - 18 labels per sheet. 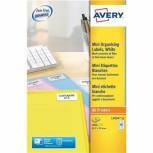 Avery Laser Mini Labels 45.7x25.4 Sheets White (Pack of 1000) L7654-25 Pack of 1 Avery Laser Mini Label. Ideal for small item labelling, bar-coding etc. Easy to format using popular software packages. Suitable for use in most mono laser printers. Label Size: 45.7x25.4mm (40 per sheet). Colour - White. Avery Laser Address Labels QuickPEEL 64x33.86mm 24 Per Sheet White (Pack of 240) L7159-100 Pack of 1 Avery White Laser Labels. Premium labels, easy to use and specifically designed to work in the high temperatures of laser printers, ensuring high quality printing with no toner flaking. Address. 64x34mm. 24 labels per sheet. 100 sheets per box. 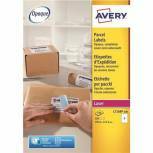 Avery Removable Labels 63.5x29.6mm 27 Per Sheet White (Pack of 675) L4737REV-25 Pack of 1 Removable laser labels adhere securely to any smooth surface and are easily removed when needed. Easy to format. 63.5 x 29.6mm. Ref: L4737REV-25. 27 labels per sheet. 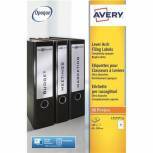 Avery Lever Arch Filing Laser Labels 200mm x 60mm (Pack of 400) L7171-100 Pack of 1 Specially designed to fit the spines of lever arch files. 200x60mm 4 labels per sheet, 100 sheets per pack. L7171. Avery Laser Address Labels QuickPEEL 99.1x34mm 16 Per Sheet White (Pack of 1600) L7162-100 Pack of 1 Avery White Laser Labels L7162. Premium labels. Easy to use and specifically designed to work in the high temperatures of laser printers. Address. 99.1x34mm. 16 labels per sheet. 100 sheets per box. Avery Laser Parcel Labels 199.6x143.5mm 2 Per Sheet White (Pack of 200) L7168-100 Pack of 1 Avery White Laser Labels. Parcel. 199.6x143.5mm. 2 labels per sheet. 100 sheets per box. Avery Laser Address Labels QuickPEEL 99.1x38.1mm 14 Per Sheet White (Pack of 1400) L7163-100 Pack of 1 Avery White Laser Labels L7163. Premium labels. Easy to use and specifically designed to work in the high temperatures of laser printers. Address. 99.1x38.1mm. 14 labels per sheet. 100 sheets per box. 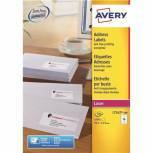 Avery Laser Parcel Labels 99.1x67.7mm 8 Per Sheet White (Pack of 800) L7165-100 Pack of 1 Avery White Laser Labels. Parcel. 99.1x67.7mm. 8 labels per sheet. 100 sheets per box.